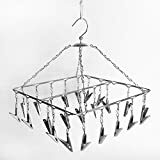 Amazon's Choice for "cloth stand"
Sold by Karma Steel Co. (4.6 out of 5 | 1,290 ratings) and Fulfilled by Amazon. Gift-wrap available. 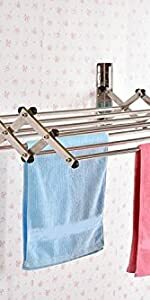 Shop for AmazonBasics Foldable Steel Drying Racks. 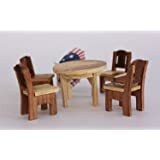 High Quality Products at Great Prices. 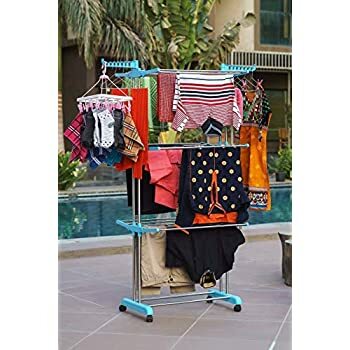 Parasnath Cloth Drying Stand - Winsome - Drying clothes is now faster and easier with this attractive, large cloth drying stand from Parasnath. 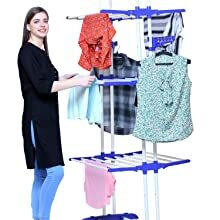 Providing an effective household solution, this dryer has been designed to have sufficient spaces and lines, which can be used for different garments. 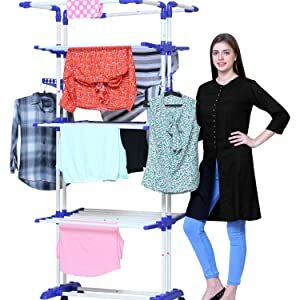 Place it anywhere in your home, as it compact shape allows it to fit easily in your home and it comes with durable material, ensuring that you never have to worry about its sturdiness.. The product can be used in bathrooms as well because of its anti corrosion and anti rusting feature. This product is a multipurpose addition for urban homes. 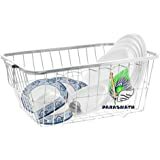 Parasnath began as a housewares design company over 3 years ago with a core goal in mind- to offer innovative storage products for the home at a reasonable price. We design products that provide solutions for organising your everyday living space. Our product solutions are designed for the bathroom, home, kitchen, pantry, closet, laundry room and more. Intermixing trending fashions with durability and functionality are what we bring forward in our collections. 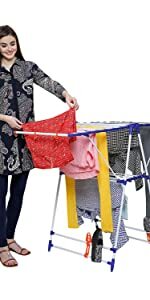 Parasnath brings to this retractable cloth drying stand to relive you from all the cloth drying woes. 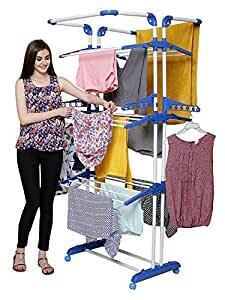 The stand features multiple stands to dry your apparel, intimates and other cloth items within the comfort of your home, It is made from steel. 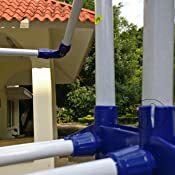 Strong and durable tubular construction made of polypropylene copolymer, plastic coated steel pipe with a heavy frame design to stay with you for a very long time. 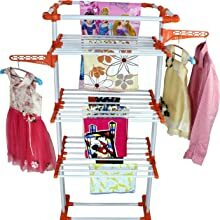 The cloth dryer can be adjusted to stand against wall in half on lesser load or full with maximum load. The multiple folding arms makes in versatile and easy to use. 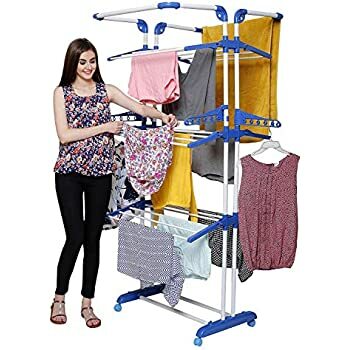 There are additional arms for hanging clothes in a hanger. The hanger can be fixed in the holder of the extended arm. It is an essential product for every house hold with multiple usage. 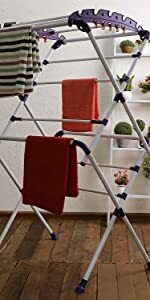 Parasnath cloth drying stand features an accordion style design which can be raised and expanded into an upright position and hooked up to secure and lock it in place. Easy to move with 6 caster wheels even on full load include 2 break lock wheel . Castors also protects floor from scratches. 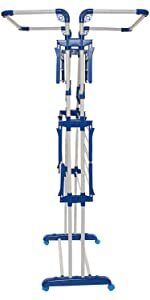 These wheels are mounted inside a housing, with a special bearing that created less friction while moving the rack as well as they ensure a smooth 360degree range of motion and rotation. This makes the movement of the rack very easy without the rack chassis needing to change direction. The size is such that it can easily fit in a corner of your living room, bathroom or your balcony. 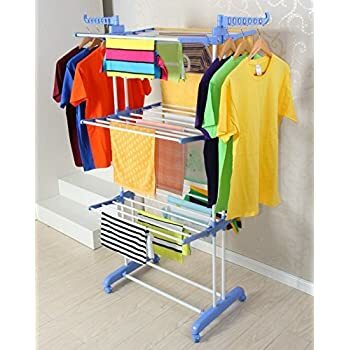 The cloth drying stand can be retracted and disassembled when not in use. 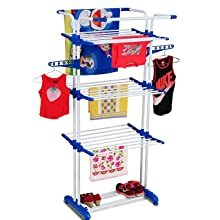 this makes it easy to use and store when you have a space crunch in your home. Unique multi structure design for modern house. 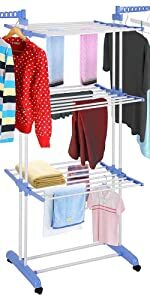 The strong durable rods provide plenty of hanging space conducive to adequate air flow for faster drying. 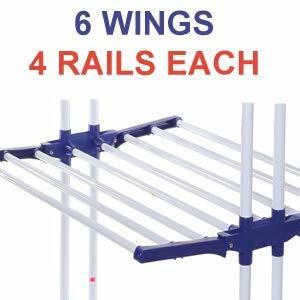 The metal rack is waterproof coated providing a clean appearance while helping to eliminate odors, stains and mildew. 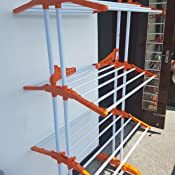 When you are finished with drying the clothes he rack can quickly be folded flat for compact storage in a closet or next to your washing machine ready to be used after your next wash. 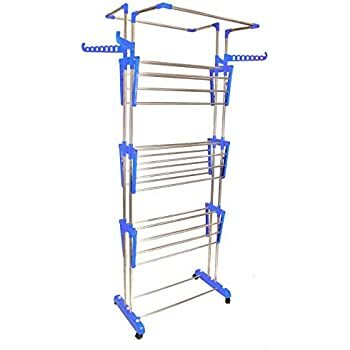 The strong durable rods provide plenty of hanging space conducive to adequate air flow for faster drying. 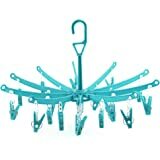 The metal rack is waterproof coated providing a clean appearance while helping to eliminate odors, stains and mildew. 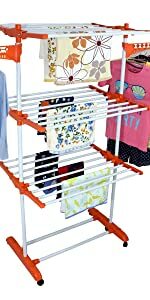 When you are finished with drying the clothes he rack can quickly be folded flat for compact storage in a closet or next to your washing machine ready to be used after your next wash.
Parasnath 3 Poll cloth drying stand features an accordion style design which can be raised and expanded into an upright position and hooked up to secure and lock it in place. The size is such that it can easily fit in a corner of your living room, bathroom or your balcony. 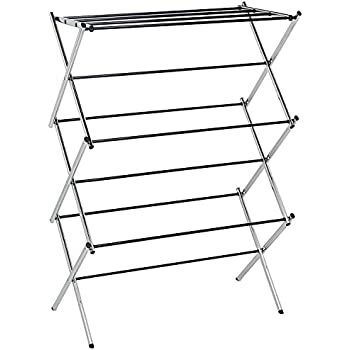 The cloth drying stand can be retracted and disassembled when not in use. 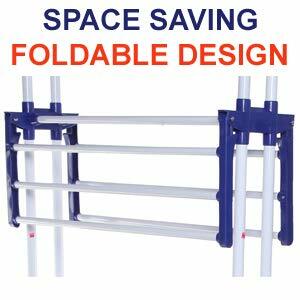 This makes it easy to use and store when you have a space crunch in your home. 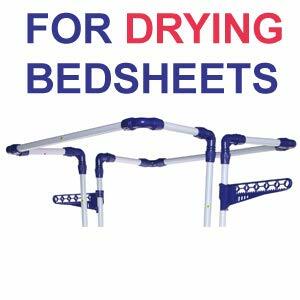 Fold the middle frame if you need to dry a bed sheet on the top frame as it requires more space for hanging. 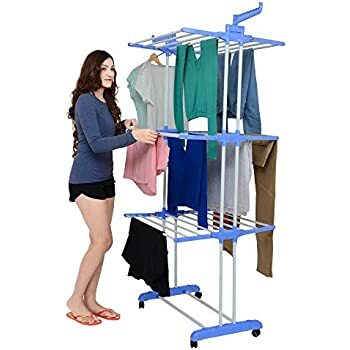 There are additional 2 arms for hanging clothes in a hanger. The hanger can be fixed in the holder of the extended arm. It is an essential product for every house hold with multiple usages. in the 4th tier is cracked 2nd day of use. In the 2nd stand , some parts of the top shelf were missing . I have put both pictures , for seller to see this . NOW that we have to return the entire product as some parts were missing , we will have to dismantle the entire thing , and that also will take 1 hour . 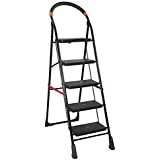 Amazon must take action to remove the word " Stainless steel" from product description as it misleading and fooling the customer by charging the higher price by the supplier. Product is Mild Steel powder coated. 6 wheels ( 2 Lockable + 4 free moving type) supplied as required. So no missing parts. only one bottom pipe gripper end was slightly damaged, but somehow managed to assemble. Product is not very sturdy. Colour selected blue but sent Orange one. Not a good quality product and returned the same. Very cumbersome to assemble and the pipes don't align, and requires quite an effort. In case of big clothes, it slides and not very good in balance. 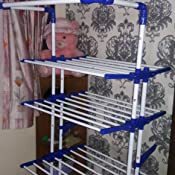 Product is good and it is bigger than we imagined..assembly is hard as there are many pipes and parts, but picture manual help alot..overall product is good but will write again after few months of use for durability..
Got it like a week back. Lets go through the list bullet point style shall we. - Unstable structure: I figured out that this product have stability and stability isn't thr. Top structure topples a lot and it can just come down thrashing to ground. - It bends: It bends a lot and if not immediately will definitely bend over 1-2 months because the whole engineering to hold the top structure is broken. - Very low Wheels quality : It often come out Moving it is a pain and it has a fear of falling down. 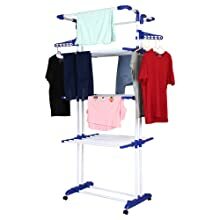 - Expensive: If i have to pay 2500 for something which lasts for 6-12 months at max, its like paying almost 10 rupees a day subscription just to hang ur clothes, so its not desirable. - Average looks: It doesn't give the right decor which i was looking for but its okay enough. 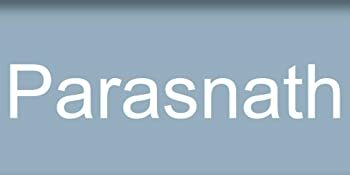 - Reduce 1 level in structure to get rid of few issues since u already paid. 4.0 out of 5 starsSatisfied with the product. I'm satisfied with the delivery (which was within 5 days). Product is also good and complete, nothing missing. The connecting pipes are also strong and sturdy. 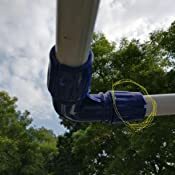 But the crown frame at the top is a little bit weak by its connectors so it droops a little if some heavy cloth is hung on it for instance a wet towel. Rest is fine. Neutral : Had to put some efforts to assemble, because sockets were too tight compared to piped. But probably this is due to very hard plastic , and because of low skill to assemble such product.